Consumers nowadays expect their media devices to offer a wide range of VOD services, apps and games. With Android TV many of the possibilities users know from their tablets and smartphones are now available on a TV set. With Google TV Services (GTVS), Google provides many important features like Google Play Store, YouTube and Voice Search. The classic TV experience is embedded in Android TV as a TV application which can be used with all the other applications to create a rich user experience. 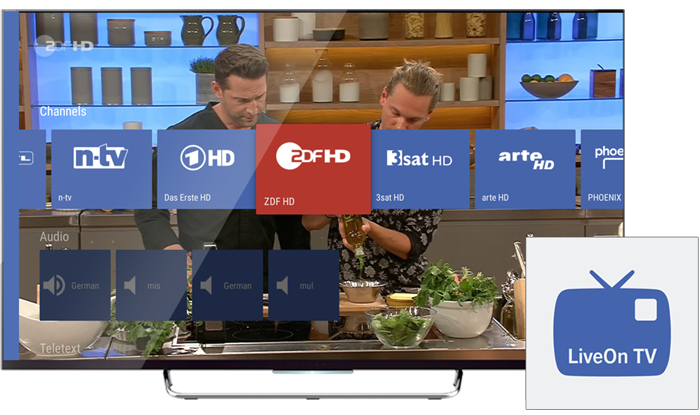 We provide all the components and support you need to realize a TV experience on Android TV devices – this includes well-known features like HbbTV, Subtitles and Teletext. As a company based in Munich in the heart of Europe, we offer you open communication, solutions orientation and flexibility you require for your product to be successful. Inaris is integrated with the Android TV Input Framework (TIF), Google’s framework for TV functionality. We also provide a full featured DVB/IPTV Java API that can be used in combination with TIF. OTT is getting more and more important for features like Replay TV and Network PVR. With our modular Inaris DVB/IPTV Middleware we provide exactly the features you need for DVB/IPTV reception and integrate it with new OTT services. Android TV is a complex framework. We support you to find the best way how your product can be realised with Android TV. We adapt and extend our software stack to your requirements. For many years we also have specialized in TV user interfaces. TV Application is an Android application that uses the OIPF for Android API in addition with Google’s TV Input Framework for TV functionality. 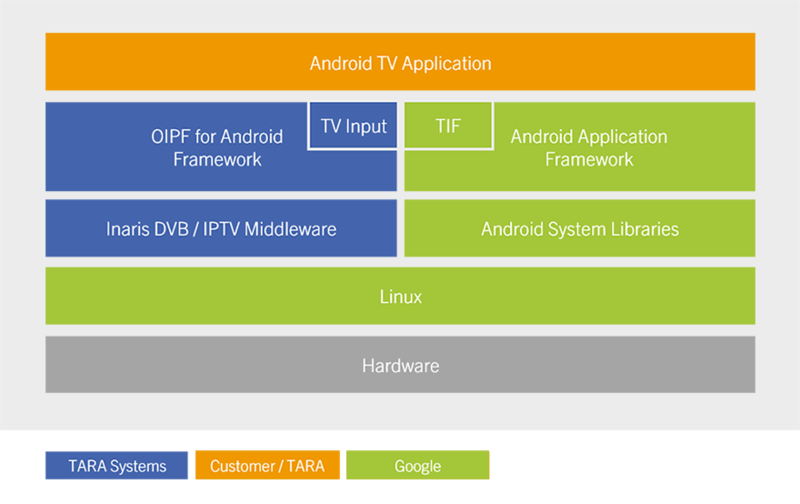 TV Input Framework (TIF) is part of Google’s Android TV SDK that can be used to for TV functionality. OIPF for Android is our standardized JAVA API to our Inaris DVB/IPTV Middleware that let you access to all TV features. 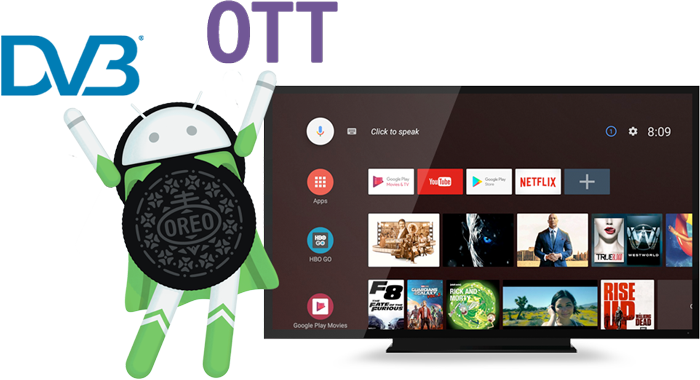 TV Input Service is implemented using the OIPF for Android API to provide TV features to Android TVs TV Input Framework. Android Application Framework is Google’s standard application framework. Android System Libraries are Android’s native libraries that are part of Android’s runtime environment. Inaris DVB/IPTV Middleware is our middleware for all TV functions. Linux is Android’s Linux distribution. Hardware is the device were all SW components run. Our Inaris DVB/IPTV Middleware uses an Hardware Abstraction Layer (HAL) to support different hardware platforms. LiveOn TV is our reference TV application for Android and Android TV. The application uses the Leanback library and is a perfect starting point for customer projects. LiveOn TV accesses the Inaris DVB/IPTV Middleware using the OIPF for Android API. The application exposes a channel to the Android Launcher for fast access to the TV services with live preview. Besides of live TV functionality for DVB-C2/T2/S2, IPTV and channel management, also HbbTV and Teletext is supported. LiveOnTV was validated on Sagemcom set-top box and NVIDIA Shield. Extensible and Customizable: LiveOn TV is written in JAVA and can be adapted easily to the project requirements. Well documented: We provide a comprehensive documentation for the LiveOn TV application as well as for the OIPF for Android API to make development easier. With us as a partner, you have access to all strategic DVB/IPTV software components in source code and you can control the application development process. As a Munich-based company, you have a local partner in Europe, who understands your needs and can respond to new requirements and changed priorities on short notice. We use our Inaris DVB/IPTV software components which are deployed in millions of CE devices also with Android TV. With us you will reach product launch quickly and safely. What Are The Benefits of Your Customers? Customers will be delighted with robust software. Daily automated tests is a matter of course for us. Apps, media libraries, HbbTV applications, games, all seamlessly transferred to the linear TV world. Our expertise in embedded GUIs means even the most discerning smartphone users will be satisfied, and their confidence in your brand will grow. We constantly develop our product further in order to keep abreast of leading-edge technology. 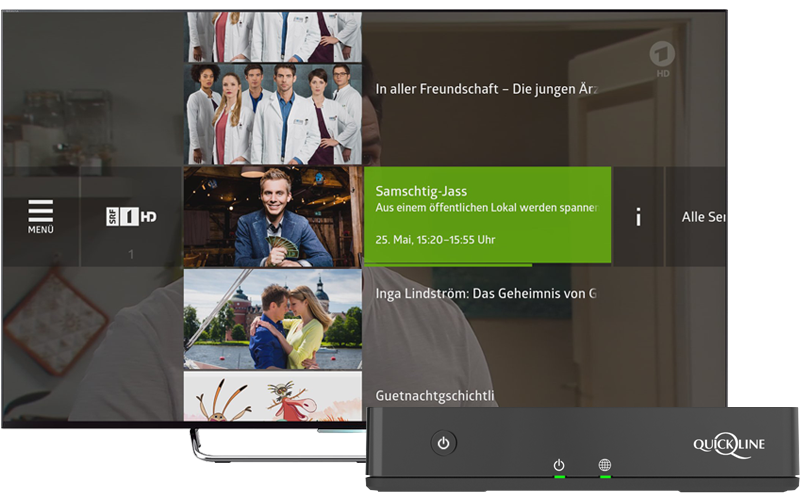 Quickline is launching a hybrid UHD Android TV STB with DVB-C, OTT streaming for time-shifted TV, Replay TV, Network PVR, VoD and radio services. TARA contributes its TV middleware including the playback of DVB and OTT services as well as the communication with the backend servers.